Add the lat pull-down and chest press combo fitness equipment to your outdoor gym. The lat pull-down targets the shoulders, biceps and core muscles, while the chest press works out the chest, upper and mid abs, forearms, and triceps. Working these muscles will strengthen the back and improve posture. The comfortable seat provides back support and the overhead handles are easy to reach. Line them up at the park combined with our other outdoor fitness equipment to create an outdoor gym for everyone. No rust, corrosion or chipping. Eco-friendly, powered by the people. Post safety instructions with the optional Fitness Message Boards. 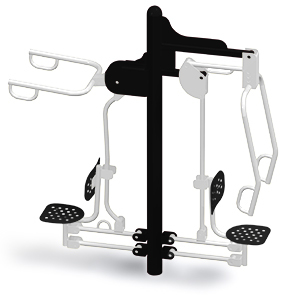 The state of the art finishing process used on the Lat Pull Down & Chest Press Combo Machine combines the application of an 'Electrocoat Zinc Rich Primer' with a durable polyester powder-coat top layer to ensure every crevice and joint is completely sealed, providing full protection against	corrosion and weathering. Lat Pull Down & Chest Press Combo Machine are finished in either a gloss or textured polyester powder-coat finish. Mix & Match any of the color options shown below to promote your school, university or company's unique colors. 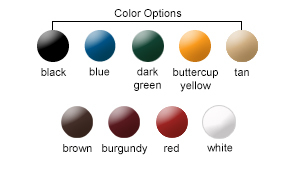 Please select "Multi | Custom Colors" from the drop down menu and a customer service representative will contact you for details. Lat Pull-Down: Strengthens upper back, shoulders, biceps and core. Chest Press: Strengthens chest, shoulders, upper and mid abs, forearms, and triceps. Broadens shoulders and tightens core muscles to improve posture. Strengthens back and improves posture. Not suitable for people with general health conditions. Do not over exert yourself. Keep fingers, toes, hair or other body parts away from equipment elements during exercise.